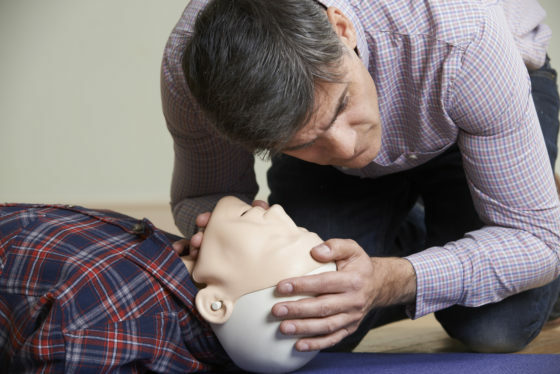 New occupational first aid training requirements in B.C. This entry was posted in Training & education on 2018/08/01 by Susan. WorkSafeBC updated its occupational first aid training in July 2018. The changes make it easier for students to remember what to do in an emergency. WorkSafeBC’s occupational first aid (OFA) training requirements changed on July 1, 2018. To find out more about what’s different, I contacted Dan Westerby, manager of WorkSafeBC’s Certification Services. In the past, OFA training focused almost entirely on traumatic injuries, Dan said. But within the new curriculum, OFA students will also learn what to do when people have diabetic reactions, seizures, critical incident stress, and mental health issues. They also learn about the benefits of naloxone, a drug that saves lives by reversing the effects of opioids, including fentanyl. Dan explained that WorkSafeBC – and other workplace safety regulators across Canada – are making the changes to their OFA training programs to align the course content and delivery with new CSA standard Z1210-17, First aid training for the workplace – Curriculum and quality management for training agencies. Dan was part of the technical working committee that developed the new CSA standard. The committee was made up of 40 members, including representatives from safety regulators, government, training agencies, and public interest groups. They based their decisions on data from the International Liaison Committee on Resuscitation (ILCOR). Every five years, ILCOR publishes a report that details best practices for resuscitating people, based on data from around the world. Please note that OFA certificates issued before the new curriculum will still be valid until they expire. Visit WorkSafeBC’s first aid attendant certification page for more information about the different levels of OFA training. Also, this announcement gives more details about the new first aid training requirements. For related posts, see Can occupational first aid attendants administer Naloxone? and Finding first aid training providers in B.C..